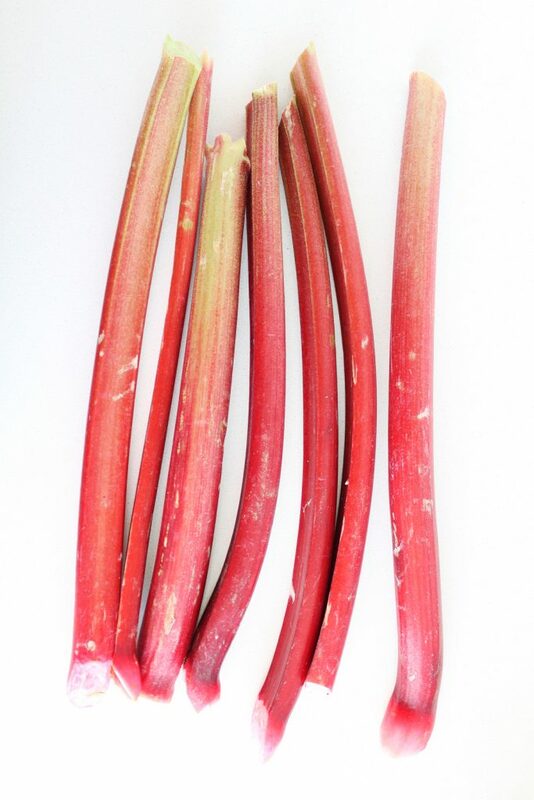 If you’ve ever seen/grown rhubarb, you know what I’m talking about. 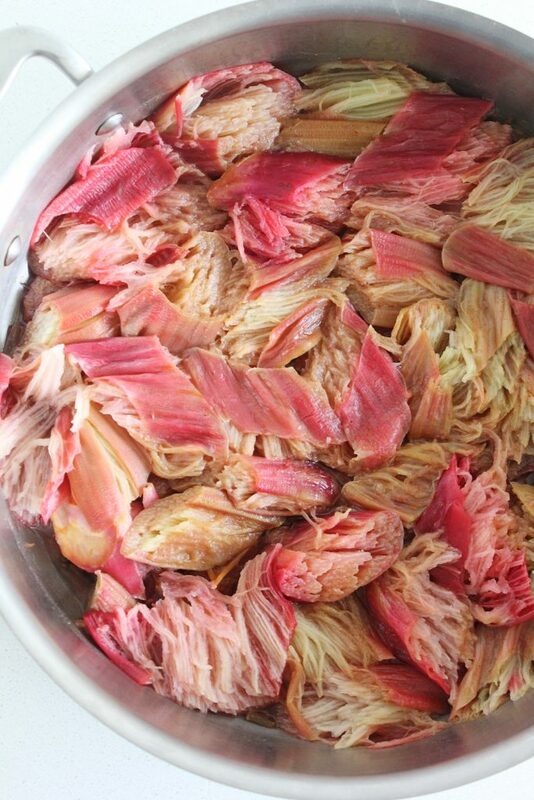 It looks like celery on an acid trip with its hot pink ribs (eat these) and big green leaves (don’t eat those). My Mom fought past my slobbery dog (he <3 her the very best) to get past the raspberry maze to the rhubarb rainforest to stew some up for her (mostly) closed-minded pre-teen daughters. Only my yoghurt and fruit-loving sister would touch it. It looked like a pink swamp and it was nice for Jaimie to have something that was hers. Once I finally tasted it (it didn’t take long, I’ve always hated having food aversions, especially ones that others enthusiastically embrace), I couldn’t believe that something that stewed up into such a homely pile of squiggles, could taste so vibrant and alive. I ate that $h*t on everything, at least til the end of the season. 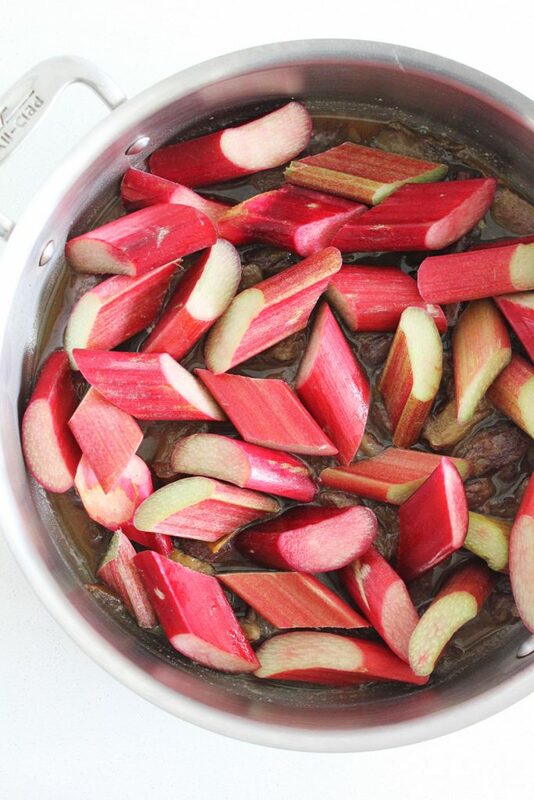 The thing about rhubarb is it is sour! That’s what I like about it, the flavour is so unexpected and exciting (what else would you expect from psychedelic celery?) The problem is that in order to eat it in abundance (which we obviously want to do) it needs a sweet balance. This usually means two cups of sugar but we got sneaky and used unprocessed, fiber and mineral-rich dates instead. It still tastes AWESOME. The first time I made this with the date-sub, I kitchen danced. There is a bit more fiber thickening things up, but it’s not too noticeable and actually quite a welcome textural addition, in my opinion. Despite the fact that it’s naturally sweetened, it’s still sweet. So it might not be ideal for active cancer. HOWEVER! 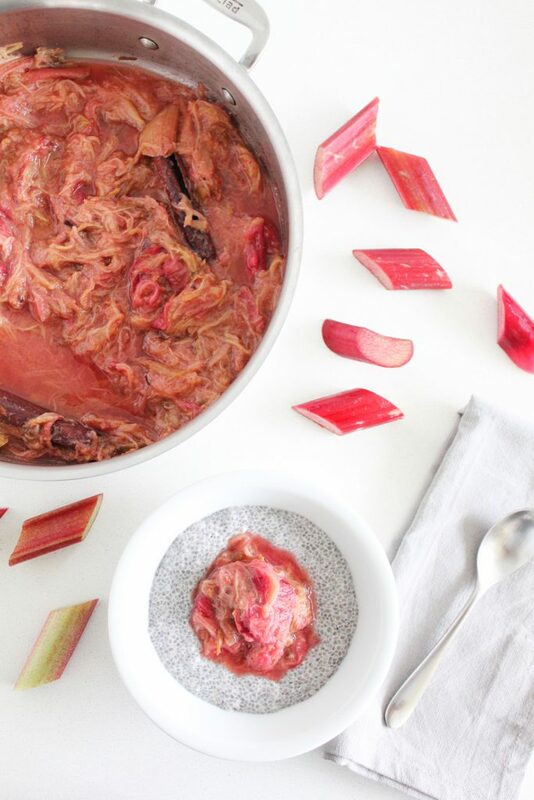 If you are craving rhubarb pie and feeling a bit sorry for yourself (or if you fell off the wagon weeks ago and are looking to cut back on your rhubarb pie intake), this is a much healthier, deeply satisfying option. Serve it on your oatmeal (or your Overnight Oats)! Pour a little coconut cream over top! 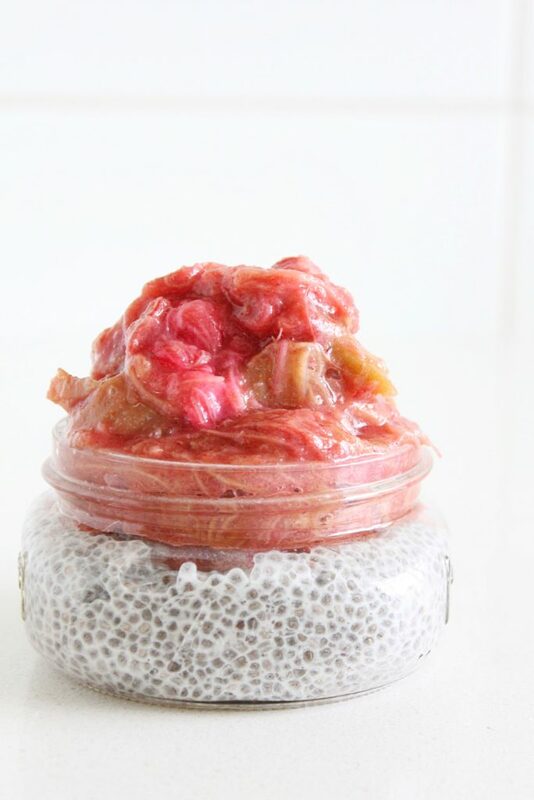 Or do what we did and serve it atop a simple Chia Pudding. 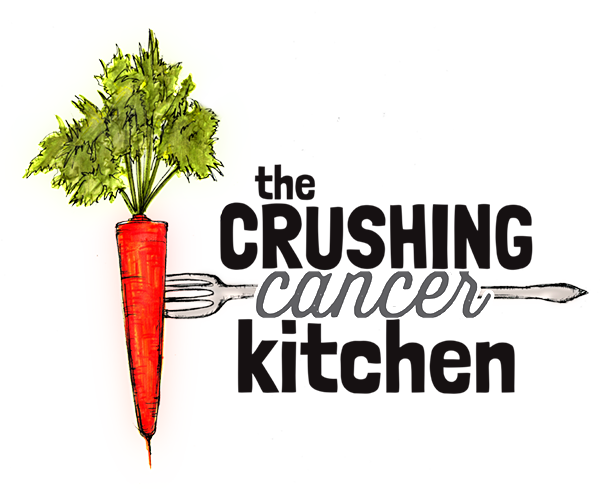 Serving it with anything that contains fat and fiber will help to lower its glycemic load, making it less of a cancer cell buffet. We have added cinnamon and cloves to this recipe, giving it a distinctly warming taste. I know that for many of us, warm weather is approaching, but warming foods are not all about your body temperature. 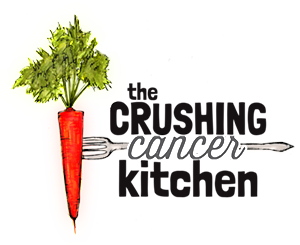 They also improve circulation and digestion (help with bloating), two things that many people who are going through cancer treatment need help with. I like to add spices when the opportunity arises as they all have healing properties (in this case the cinnamon also helps to slow down the absorption of the sugar to your system). That being said, you could sub the cinnamon and cloves out for ginger (still warming but a more spiky spring flavour) or add a bit of vanilla bean instead, or nothing at all if that’s how your palate is rolling these days (old school –it’s really good this way too). Replace half of the dates with two cups of strawberries once they’re in season (or blueberries, or blackberries or plums). 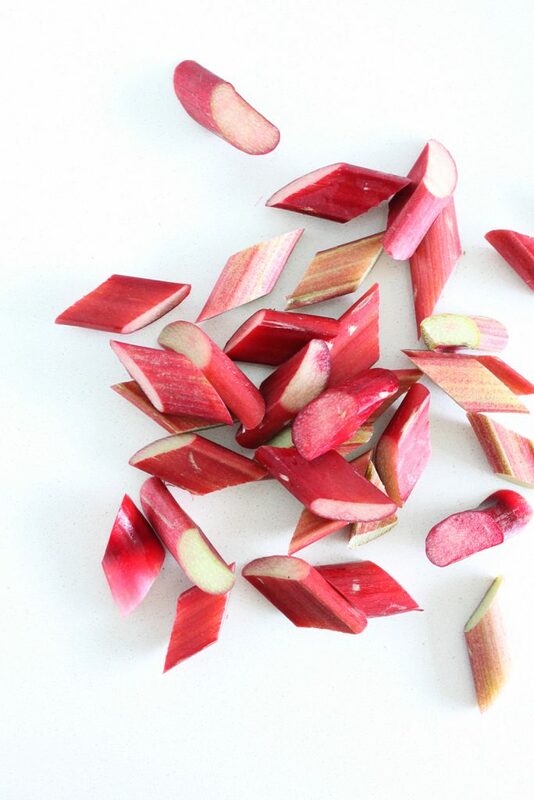 Fresh rhubarb freezes well, so freeze it now for future berry pairings. This finished recipe freezes well too so make a big batch to pull out when you want a special treat. 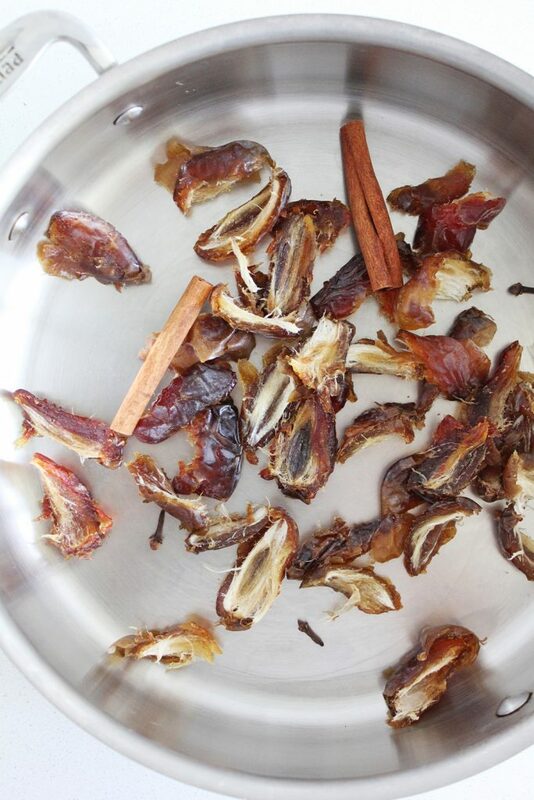 In a wide-bottomed pot (or frying pan), tear up the pitted dates in half and throw them in with the spices and water. Let simmer until about an inch of water remains. 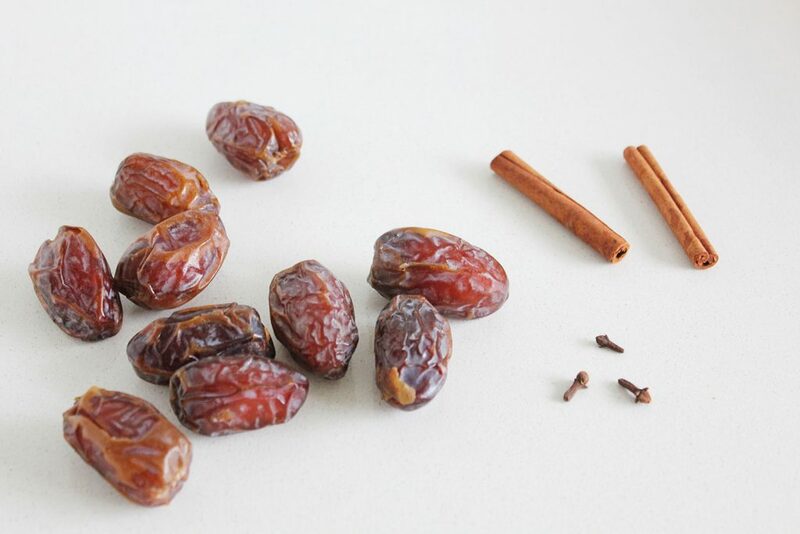 With a wooden spoon, squish the softened dates up a bit more to release more of their sweetness. Turn off the heat and stir it up. 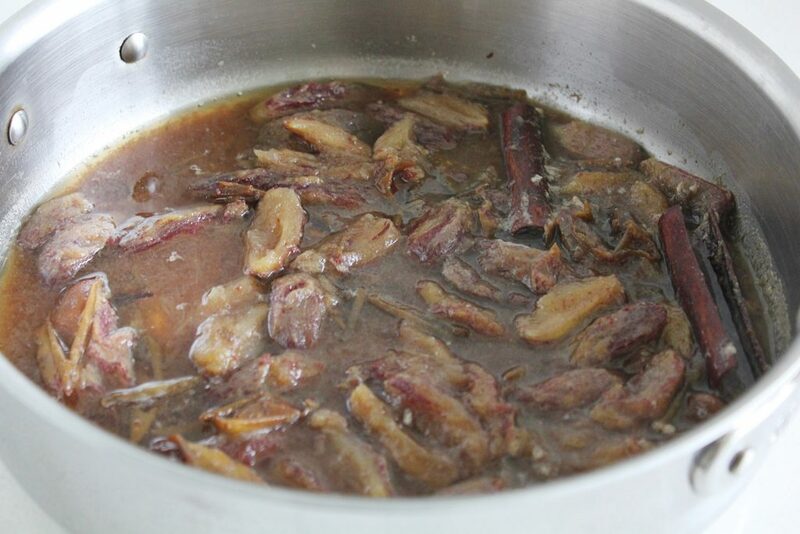 Add water if it's too thick or let it simmer down a bit more if it's too watery. Serve on coconut yoghurt or chia pudding with a sprinkle of muesli, on top of your oatmeal or with a scoop of whipped coconut cream. 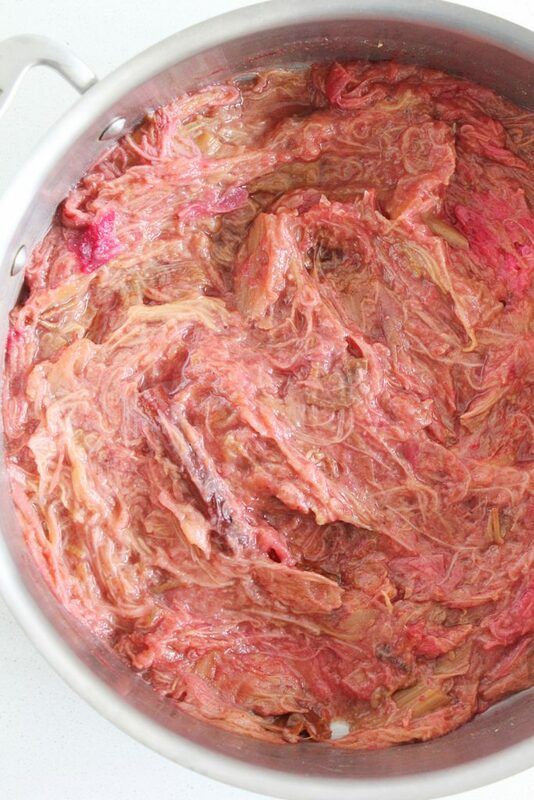 Keeps for 5-6 days in the fridge. Freezes well! Amazing! I’m going to make this tomorrow and eat it for the rest of the week!